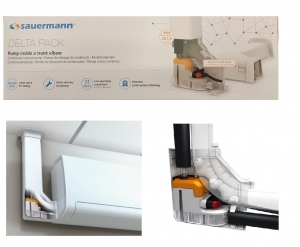 The Sauermann Delta Pack condensate pump is an ideal solution for wall mounted air conditioning units that require condensate generated water to be removed from the indoor unit when a gravity route cannot be used. The condensate pump itself is installed into the trunking elbow with the kit itself containing a straight piece of trunking, ceiling plate and all other necessary items to easily fit this condensate pump. See below the brochure on the Sauermann delta pack condensate pump trunking system.